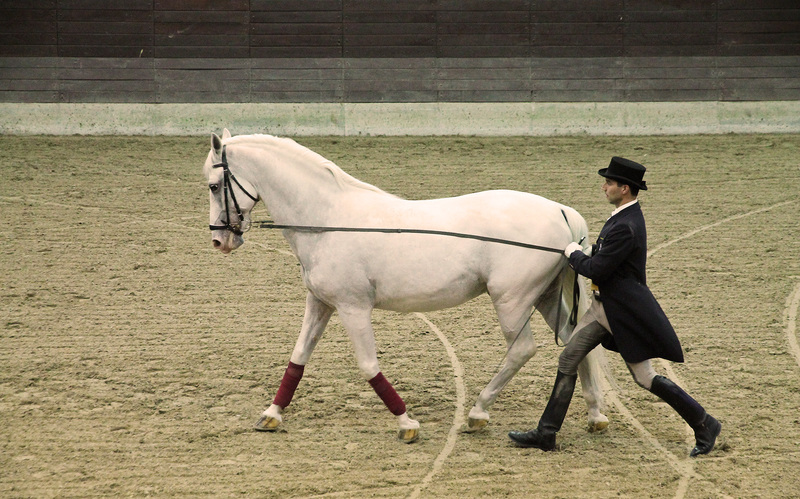 When the Austrian Archduke Charles, son of Ferdinand I, established a stud farm in (then) Lipizza to breed horses for the Spanish Riding School in Vienna, this was the start of a breeding process that finally resulted in the development of an elegant, white breed known as the Lipizzaner. 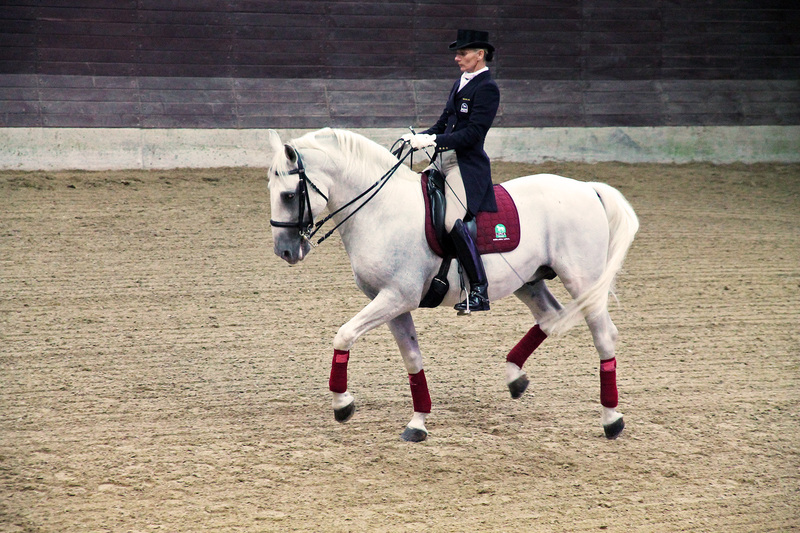 It is a cross between Spanish Andalusian horses, the local Karst breed and white Arabian horses, and particularly suited for parades and dressage. 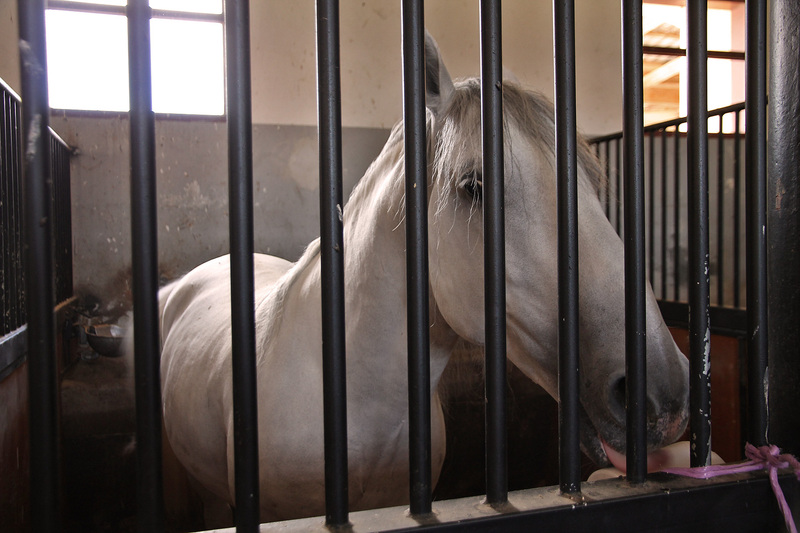 Although the foals are grey or brown at birth, these horses lose their pigment between the age of 5-10, thus obtaining their characteristic white colour. 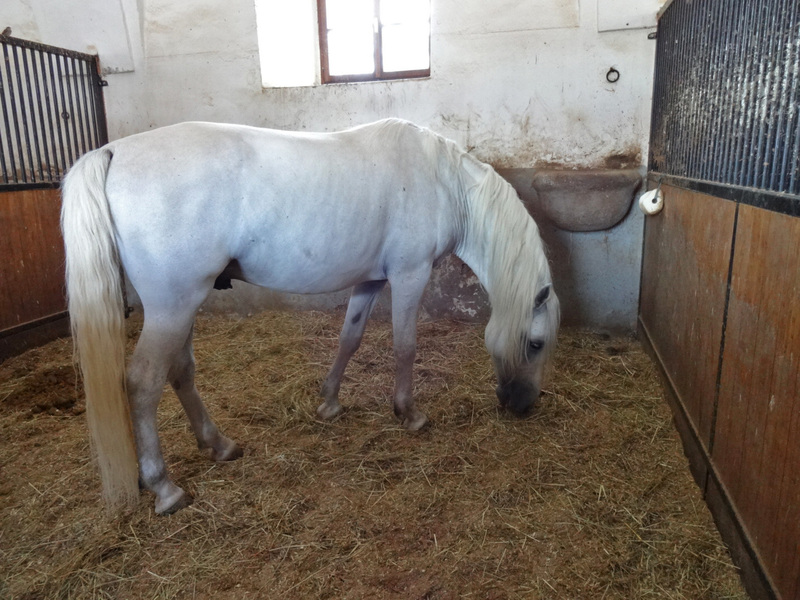 The stud farm is situated in the village of Lipica, only a 25-minutes drive from Italy’s Trieste, in the Karst Region. In the same area, the Škocjan caves (Škocjanske jame) are listed among the most impressive caves in the world and are probably the most important attraction here, although a visit to the farm is a highly recommended alternative for an afternoon excursion. Both can also easily be combined into a full-day programme. 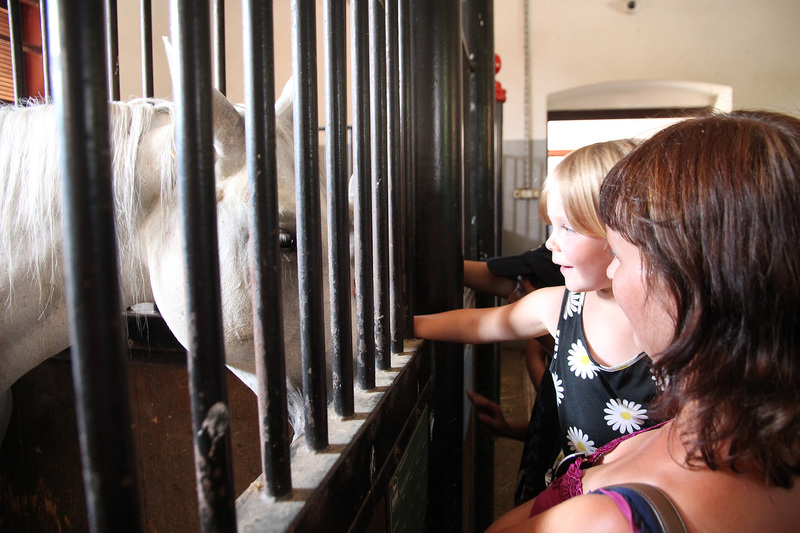 Our daughter was especially enthusiastic about visiting the horses. The road to the Lipica farm is well-indicated. 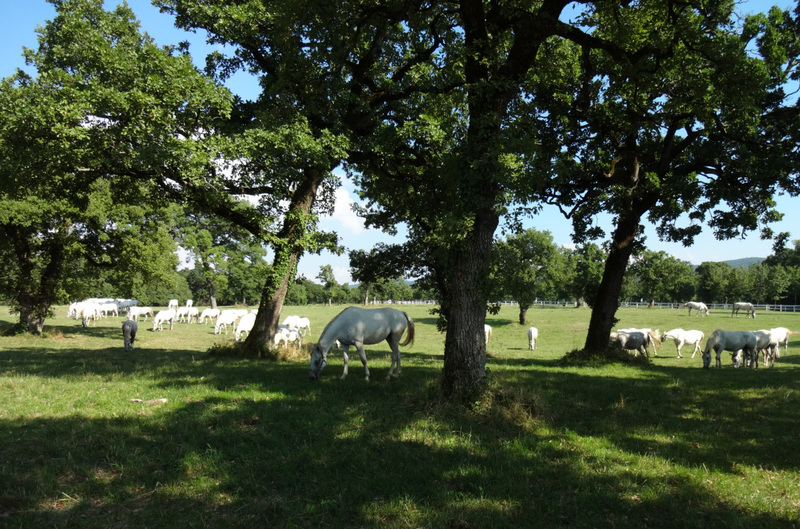 The final stretch leads you down an avenue lined with linden trees (Lipica translates as “little linden tree”), in between herds of Lipizzaners that are grazing on elaborate green pastures. The overall feel here is one of idyllic serenity. Waiting for the tour to start. 1. 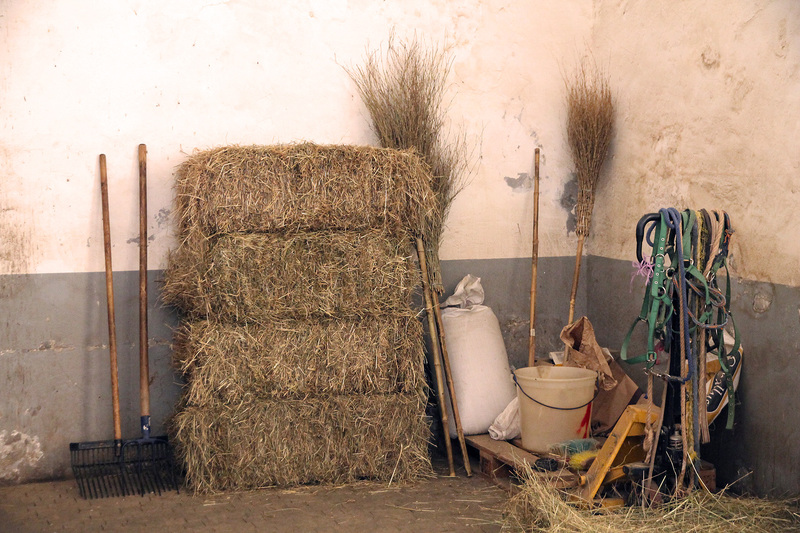 The Lipica Stud farm is closed on Mondays. 2. 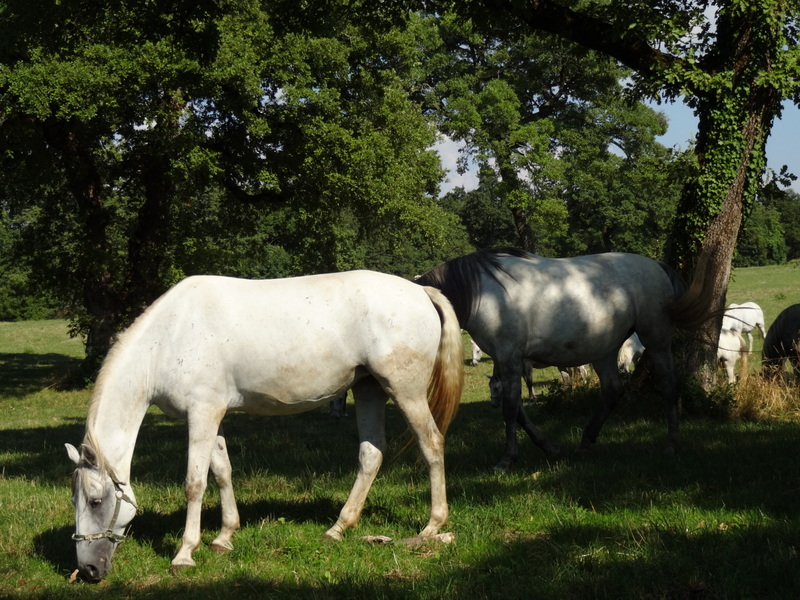 According to the farm’s website, “autumn is the most beautiful season in Lipica.” We were there in August (2015), which was fine as well. 3. Do take the guided tour, it’s worth the cost (prices and hour table can be found here). 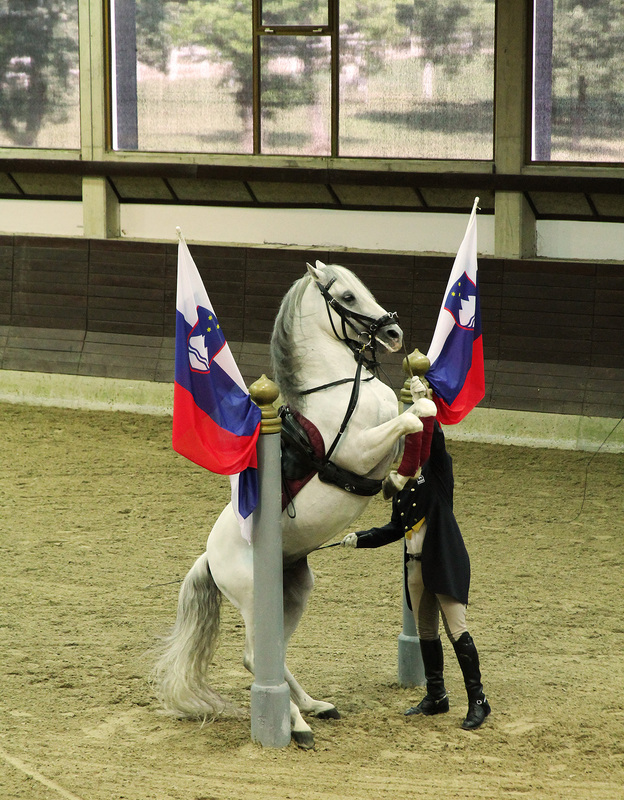 In less than 2 hours, you get to experience all aspects of the Lipizzaner and the farm: its history, breeding practice, infrastructure… Tours are available in Slovenian and English (or other languages, if requested for in advance). Our “English” group wasn’t too big, but we were really happy we weren’t Italian (clearly there are no group size restrictions…). 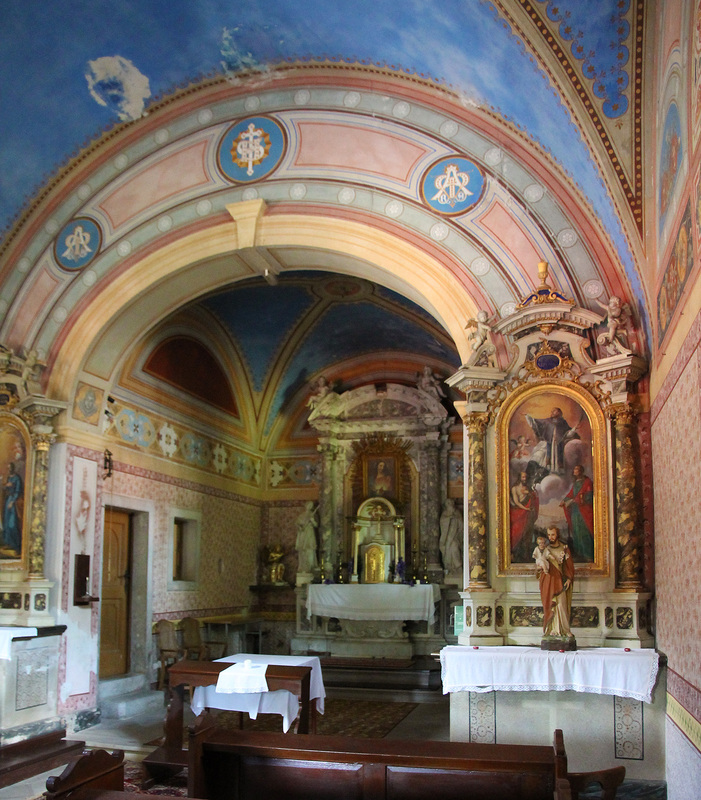 We first visited the Church of Saint Anthony of Padua, very popular for wedding ceremonies it seems (picture on the right). This would never have been our first choice for a wedding chapel. 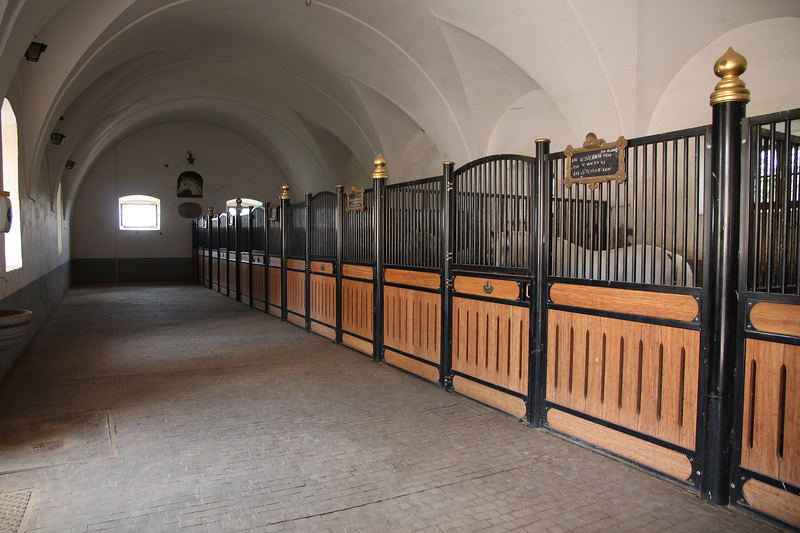 The next stop was the Velbanca stable, the oldest stable of the domain which houses the breeding stallions. 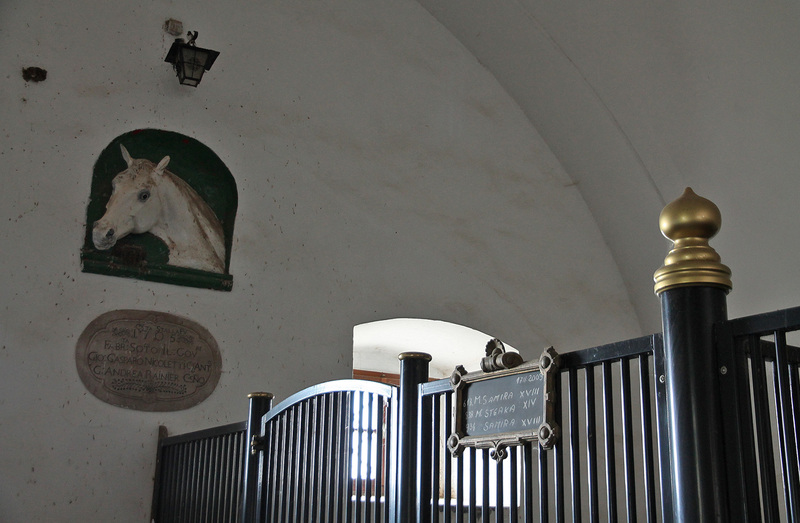 Each horse has its own antique name sign (and probably a centuries-old pedigree). Also a very popular spot for swallows. 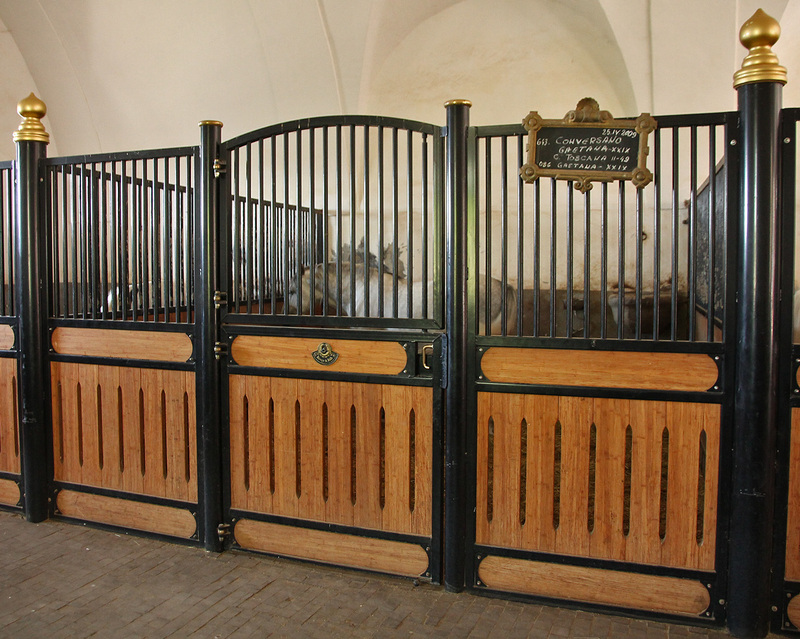 The Velbanca stable, from 1703. 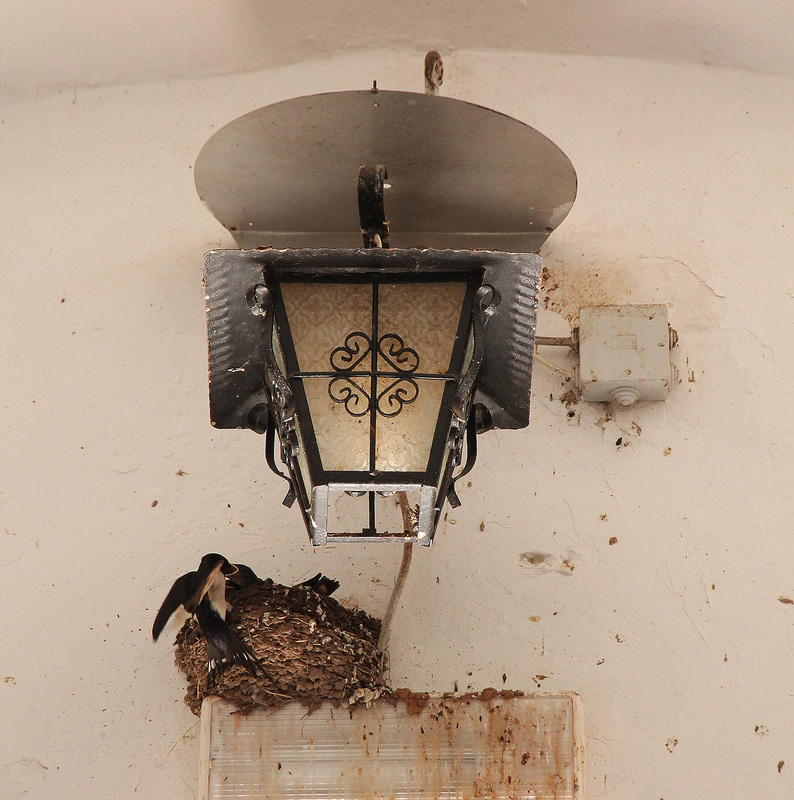 The old stable is a popular nesting place for swallows. 1705 sign in the Velbanca stable. 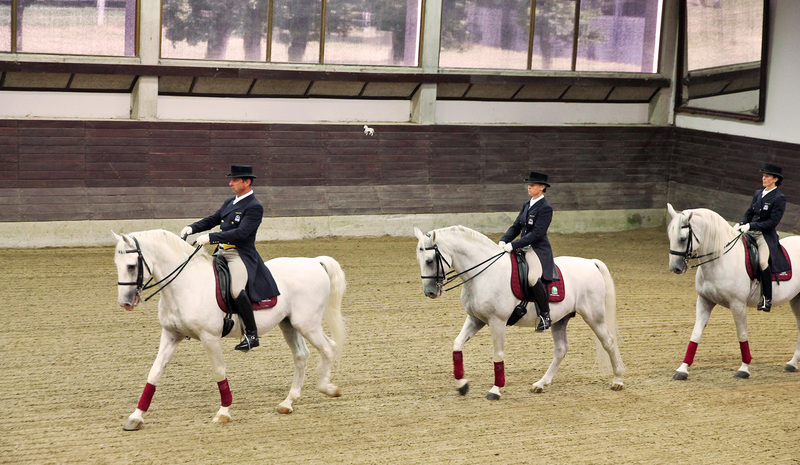 After visiting the pastures (from behind the fence, though) and another stable, the tour ended with a show performance of the horses. 4. 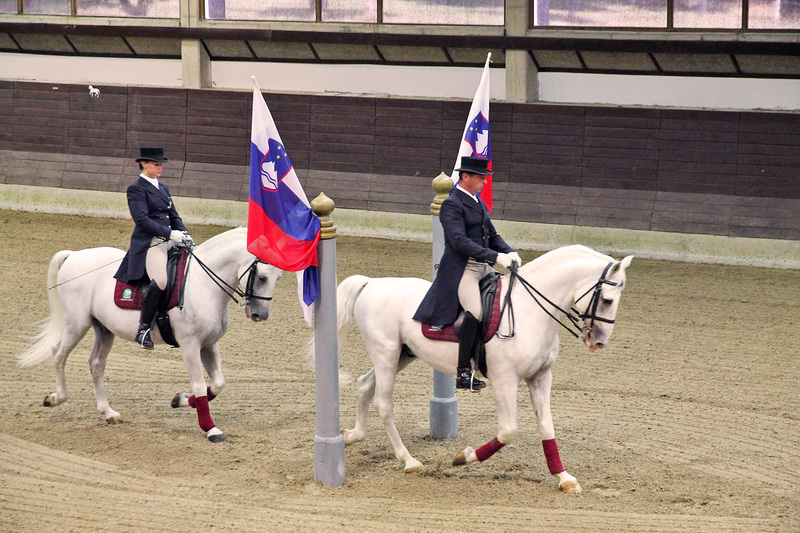 If you time your visit right, you can attend the presentation of the Lipica Classical Riding School in the riding hall, a show that lasts 45 minutes (in summer, this is at 3.00 p.m.). 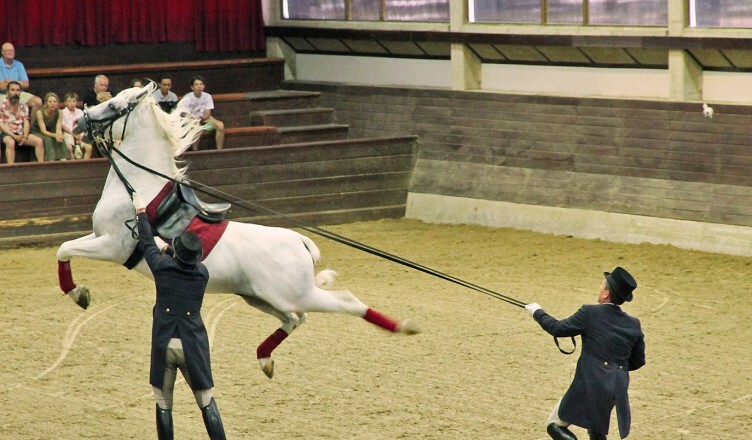 It’s comparable to the one at the Spanish Riding School in Vienna, albeit shorter. 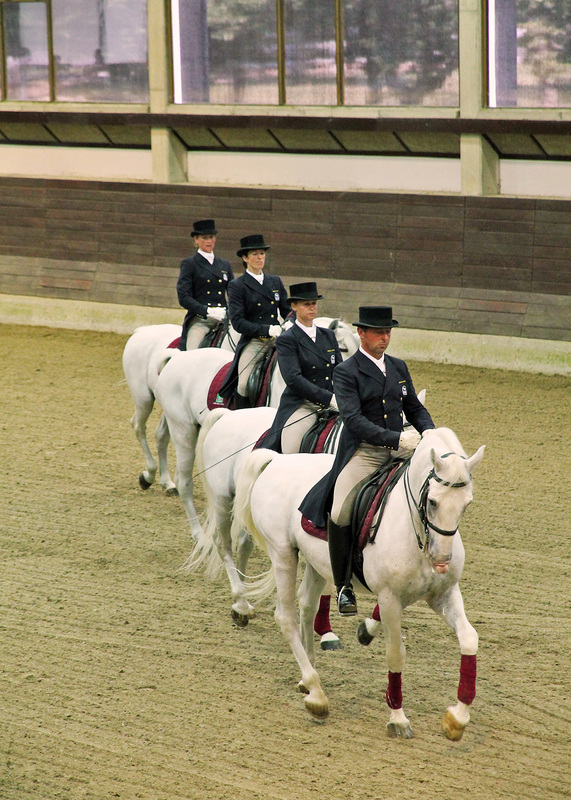 Years of training have learned the horses to perform flawlessly and in perfect harmony with each other and their riders. 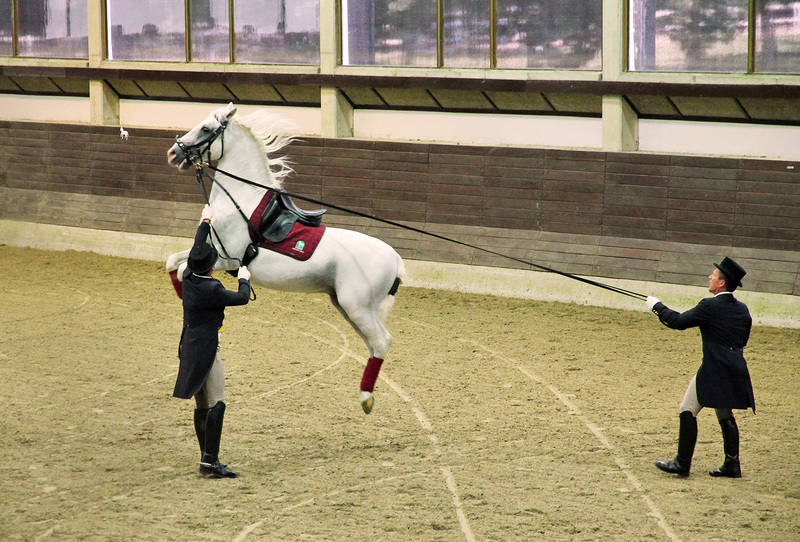 Remember never to applaud before the horses have left the hall again, as they can become quite frightened if you do so, which is particularly dangerous for their horsemen. 5. If you are planning to go on a horse carriage-ride on the estate, do make sure to make a reservation the very moment you arrive, as places are limited. We didn’t, which resulted in a serious drama. 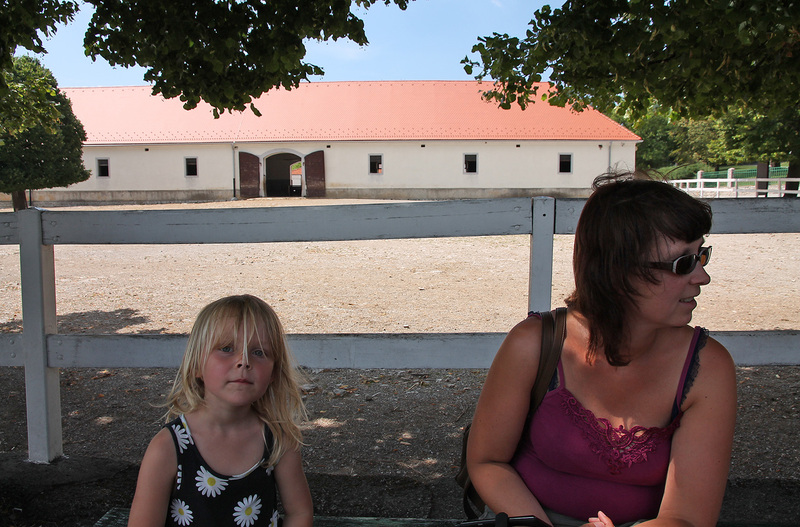 Although we inquired at the ticket office about taking our little girl in the carriage in the morning (she had been talking about it for days), the lady at the counter didn’t inform us we needed to be quick with reservations. So we took the guided tour first and went to make a reservation afterwards, only to learn that all trips were fully booked already. This resulted in our little Febe in tears, and two very angry and disappointed parents… This was a sad and unfortunate ending of an otherwise perfect day.